Planning your summer vacation? MurangLipad.com is the one-stop portal offering assistance in airline ticket comparison and purchase. Here, searching for the cheap flights is quick and easy. Besides calling the hotline +63 (2) 8490100, you can compare and book flights with MurangLipad.com through free webcall. To make things more convenient, the service provides different ways for you to pay for your flight bookings. 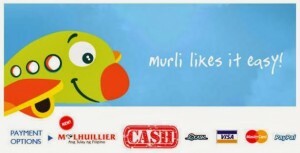 Cash at any of the Murli offices listed here. What are you waiting for? Friendly and accommodating travel specialists are awaiting to help you plan that perfect holiday with your loved ones, or that weekend warrior getaway.